Who Understands the Causes of Poverty? The poor rarely understand the causes of poverty; if they did, they wouldn’t stay poor for long. 1. Most people don’t like being poor. 2. If people understood the causes of poverty, they would know the best ways to avoid or escape it. 3. The best ways to avoid/escape poverty work well over the medium run. 4. Therefore, the people who understand the causes of poverty are rarely poor for long. Corollary: The people who best understand the causes of poverty are typically people who started out poor but didn’t stay poor for long. Lack of impulse control and future time orientation is also a cause of poverty. But I don’t think it’s quite as easy to decide to correct those causes. I assume you’re talking about poverty in the US rather than, say, poverty in Sudan. Your argument has an assumed, unpresented premise that is essential to its success. 3.1 Everyone who understands the ways to escape poverty have the resources necessary to do so. Unfortunately, necessary premise 3.1 isn’t reflective of reality (and is the core of the liberal social program argument). There are multiple institutional and individual barriers that keep people from doing this. Institutional prejudice (whether that keeps a worker from obtaining a job or succeeding in that job), lack of education (which cannot feasibly be attained when you are older with children), deep-seated habits that are passed down from one person to another (including but not limited to impulse-spending). A person may completely understand that the reason they are poor because they dropped out of school, have six kids, and have very little knowledge of how to manage money, yet still have no access to the resources to make that happen. Most people don’t like being poor. What if the choice is between being poor and working hard? Is it so obvious that most people would prefer the latter? This is Bryan’s “man of system” voice again — All We Have To Do to solve a problem is pull some lever, and society changes accordingly and with no pushback or backfiring. If we aren’t pulling the lever, then we must not know that pulling the lever has the intended effect, i.e. we’re ignorant about the causation underlying the problem. Another commenter already pointed out that you left out the part where individual human beings have enough power over their environment (living and non-living, including other people) to effect the solution that they see. Here’s a concrete example that should be, but is not, familiar to economists — a coordination problem. Some public good (or whatever) is not produced, making people poorer than if it were there. Repair of the neighborhood playground. 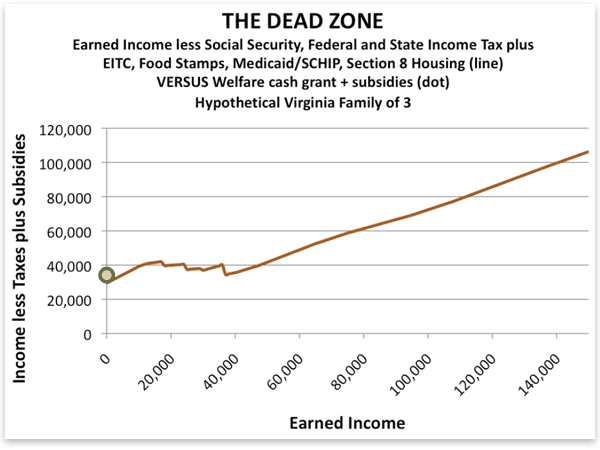 The residents aren’t stupid, and understand perfectly well about the first-order free-rider problem (free riding on the playground repair), as well as the second-order free-rider problem (free riding on an authority’s enforcing a law or meting out punishment — “no, *you* go collect taxes”), as the cause of their poverty. How much does this keen insight allow them to escape from poverty? Same goes for the poverty that comes from renting instead of owning. People are totally aware of the lower quality of rented stuff than owned stuff, but owning often requires a substantial one-time commitment of time, effort, resources, etc., that may be beyond the means of the poor. In general, be less hyperactive in your arguments. These are pretty glaring mistakes. Poverty is the natural condition of mankind. What’s needed is understanding the causes of prosperity, which only a small minority of people who’ve ever existed have caught on to (wasn’t everyone praising Deirdre’s speech pointing this out just s few days ago?). Poverty is the state of nature. 1 and 2 may both be wrong. Regarding 2, perhaps I am not smart enough to succeed at any job other than one with low wages. That doesn’t necessarily mean that I am not smart enough to realize that were I smarter, I would be able to obtain and succeed at higher paying jobs. Regarding 1, perhaps many poor people, on net, do not mind being poor, at least not enough to do what it might take to stop being poor, e.g., perhaps some value leisure over work. Or, as has been mentioned, with some perhaps it is an issue of impulse control. Maybe both come into play, e.g., I am not willing (choice) or able (impulse control) to postpone having a family at a young age. Most college students are poor. For some reason, we don’t think of them that way. Perhaps then it’s the dropping out of school, having six kids, and not acquiring money management skills that caused poverty. These are poor decisions many people don’t make specifically to prevent poverty. Also, it takes money management skills beyond common sense to retire wealthy but it doesn’t take more than common sense to spend less than you earn. Nobody taught me to save money. I figured it out when I was like 6 years old. Alternative title: Who Understands the Causes of Fat? If you think about this argument in other settings, you’ll see its biggest weaknesses. Oftentimes diagnosis is a relatively trivial part of the story. Replace “poor” with “fat,” and you’ll see the most obvious flaws. For example, just about everyone knows the causes of being fat, yet we still see fat people. Yes, even fat people know (myself included!) that consuming more calories than one burns causes weight gain. Various genetic factors can influence the rate of fat burn (i.e. metabolism), but the principle remains the same. Yet, not everyone is exactly the size and shape they’d like to be. To put it another way: I like food. The tastiest food also happens to be the worst for you. And exercise is time consuming and often fells just like hard work. Yet, I am not a perfect physical specimen, despite knowing exactly how to be one. My preferences (e.g. my discount rate, marginal utility of food, marginal disutility for exercise) and genetics dictate a great deal of this outcome. The same line of logic can apply to poverty. The diagnosis is only a small part of the story. It’s still an important part of the story for many people (because poverty is surely more complex than weight), but preferences, genetics, circumstances, and a host of other factors explain much more about why people don’t all end up rich (and perfect physical specimens too). Some people might understand why other people are poor, but they might well fail to apply that logic to themselves, as this would mean lowering their opinion of their ‘rightful status’ in society. Therefore, they are more likely to rail against society as a way to avoid reassessing themselves. Think of a bad artist who thinks government should subsidize him to avoid considering the harsh truth that his art just isn’t that good and he should do something that actually generates value for others. Thank you Scott, for what I feel is an excellent analogy. While I think that, for the reasons that you and others have mentioned, Bryan is incorrect here it is good to mention that not everyone understands what makes you fat. I would wager indeed that relatively few people do for a number of reasons. For instance you mentioned the second law of thermodynamics issue. That isn’t actually an issue for most people. If you’re eating the right kinds of foods your body will regulate energy consumed to be equal to energy input. Eat more and you’ll just have more energy (up to a point). And the wrong kinds of foods are carbs (that don’t come with a hefty dose of fiber). Fats and Proteins are just fine. Sadly his analogy only highlights the original point. His statement that being not fat just means eating fewer calories than we burn is really simplistic and sounds a lot like “being not poor is about making more money and spending less”. The truth about burning calories is that more than half of them are burned by your metabolism, and your metabolism is self correcting. Your body changes your metabolism based on the number of calories you eat, nutrients and vitamins you get and exercise/activity you do. Dieting fails for many people because of this. If you slash your daily calories in half you body thinks “oh dear god, there is no food” and slashes its metabolism. There is increasing evidence that what you eat is just as important as how much you eat. If Scott drinks soda he could probably lose 10 lbs this year simply by changing his brand to one that uses sugar instead of high fructose corn syrup. He could probably lose another 10 lbs this year learning similar tricks and changing brands in the grocery store. Simply put most of the fat people in the world don’t realize how simple it is to start losing (or at least stop gaining) weight. They don’t really understand the causes of weight gain and hence remain fat. The memes of “some poor people just don’t want to work hard” or “some people are just to dumb” or “some people lack the resources” show how broad the misunderstanding of how to get out of poverty is. Clear counter examples of poor people who work their buts off and stay poor (subsistence farmers as an extreme example), low IQ people who make it into the middle class in America, and the fact that at one point we were ALL extremely poor is dis positive to the theory that the poor are lacking in resources. If that were true we would all necessarily still be poor. Instead some of our ancestors hit on the ways to not be poor and we have benefited from them. It is even hard to say what poor is in developed countries. The poor in the USA are often overweight. Historically and outside the USA the poor are skinny. They often have enough stuff that there homes and areas look very sloppy. Poor people have the misfortune of having to live near poor people. I do not see much that can be done about that. Poor people in the USA are often aggressive. Poor people in the USA often seem too proud to serve people face to face with a smile. Poor people in the USA get can get free or reduced food through food stamps. Poor people in the USA get free schooling for their children with free or reduced lunch and breakfast. Poor people in the USA get medical care through medicaid. Poor people in the USA get subsidized housing. And yet is all for naught because we still see them as poor and IMO democrats want more of the same in a vain attempt to turn the poor into middle class people. Your reasoning has an Ayn Rand quality to it. I think it applies to many. But there are some sad people who have profound brain limitations: low intelligence, mental disorders, brain damage, severe learning disabilities, retardation. (Should drug and alcohol addictions be added to the list?) Those people would, on their own, be poor and probably have no clue as to why. There are older people who may have avoided poverty in adulthood but slipped into poverty in old age, and dementia and/or bad health could be uncontrollable factors. Finally, there are children who are poor. Should we just think of them as extensions of poor parents, or poor in their own right? And what do we do with people who are poor from actions in the past? For example, people who get HIV, people who are damaged from recklessness. They may have reformed and understand the roots of poverty, but the damage is done and cannot be undone. Yes, but one of the best ways to avoid/escape poverty is to actually be capable of doing what you know is the best solution to a problem. Would it be fair to say that the inability to executing an reasonable solution to a problem might also cause one to be poor? Let’s posit a person with a high preference for leisure and a very high present-time preference. He will work only the minimal amount to pay for food and other necessities and goof off the rest of the time. Is he wealthy or poor? In a Szaszian sense can we criticize him for making choices consistent with his extreme, non-standard preferences? As well as the requirement of the additional premise pointed out by V.A. Luttrell, the inference to the corollary is also fallacious. There is no requirement that they be ‘best’ placed to understand the causes of poverty although one could probably infer that they understand it more than those currently in poverty, on the controversial added assumption that poverty is something under the control of the poor (which is similar to Ms. Luttrell’s premise 3.1). But to say they are ‘best’ placed to understand the causes would seem to place too much weight on anecdotal experience – an epistemology that would be somewhat bizarre for an economist to embrace, what with the models and the multiple linear regressions and all. If it is the case, as I strongly suspect, that an individual person’s poverty is the result of aggregated decisions of thousands of unrelated people, then to say that an individual who escaped poverty successfully is best placed to understand the causes of poverty is kind of like saying that the most successful capitalists are best placed to understand the macroeconomy. Which is false, because of things like fallacies of composition. You can be very financially successful whilst not having the foggiest idea about macroeconomics, and you can escape poverty without having the foggiest idea why you were there in the first place. And those that were successful in such an endeavour will probably have some serious hindsight bias and be highly susceptible to overstating how their decisions led inexorably to the desired outcome. I have to disagree with Scott Wentland that most people know what causes them to be fat. I remember glancing at an article on “power foods” in a health magazine over the weekend, and seeing them list things like halving your vegetables to feel less bloated, eating more red meat to increase your iron, and eating potatoes instead of bananas to get plenty of potassium. I can think of many examples of people handing out bad nutrition advice. The concept of increasing one’s non-exercise activity thermogenesis has been around for almost a decade, but people are still hearing about treadmill desks for the first time. And how many people know that regular exercise is more important for health than keeping weight under control? I didn’t mean to enter a debate on weight loss, and I am certainly not interested in any kind of class warfare debate either…just nitpicking at the logic. I think my general point holds true, despite not highlighting all the subtleties and exceptions of weight loss. For the vast majority of people out there, weight loss involves two things: better diet and exercising more. It is true that there are more variables to consider, but my general point is that for most people understanding the root cause is remarkably simple. Of course, some diets and some exercises are more efficient than others, and may vary between persons, but my analogy was not intended to be exhaustive. The point is that most people know how to lose weight, but doing so requires a lot more than knowing what to do and may not even be consistent with preferences/genetics/etc. Back to the wider point…I think many of the commenters agree that the diagnosis is only a small part of the story. Knowing the cause of something and even knowing the solution is a far cry from actually executing such a solution. Life gets in the way. The best way to find the answer to “why poverty?” is to search out why there is NOT poverty. As someone who’s been fat, medium and skinny several times, you’re all making the weight issue way too complicated. Calories burned – Calorie intake. All else is just excuse making. I think my general point holds true, despite not highlighting all the subtleties and exceptions of weight loss. For the vast majority of people out there, weight loss involves two things: better diet and exercising more. The issue is you are confusing necessary information with sufficient information. For many people weight loss will include more exercise and fewer calories but the issues that were highlighted weren’t just about efficiency. Making basic mistakes- like starting an exercise and diet routine at the same time- will actually be counter productive and cause a physiological reaction that prevents weight loss. Simply knowing X&Y is not enough. Extending this to poverty many people who are impoverished *know* that their situation can be cured if the cut expenses and increase their income. That doesn’t mean that any cuts in expenses and any cuts in income will do. The manner in which they do it and the order in which they do it and what they do with their savings all matter. Again you will find combinations that appear to satisfy basic criteria- like taking a 2nd low paying job- but that end up being totally counter productive in the long run as it forces them to pay more for child care, or prevents them from doing unpaid work where they live that they need to get done or simply exhausts them and prevents them from doing their first job at top performance and they end up missing advancement opportunities because of it. Well as long as you are a perfectly average person and there is extremely little genetic diversity between individuals we can can safely assume that your anecdote is as valuable as much larger data involving larger samples.